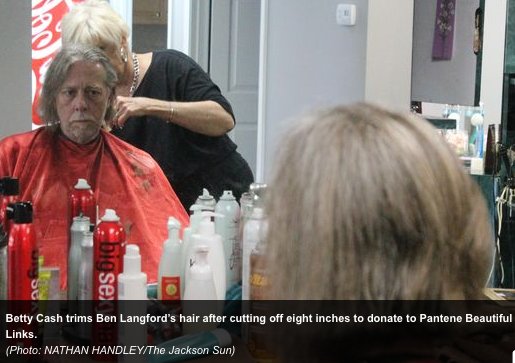 Ben Langford had been growing his hair out for five years when he got a haircut Thursday. He was diagnosed with multiple sclerosis in 2010 and began growing his hair for Pantene Beautiful Links, an organization that makes wigs for cancer patients. Langford said he is always looking for something he can do to help others. "I heard that the artificial hair they use for those wigs isn't comfortable," he said. "Real hair makes better wigs. I thought, 'Well, I can grow hair.'" Langford said he was a Beatles fan in high school, and he had long hair until he started working full time. He worked in automotive service for 39 years, but when he received his diagnosis, he could not work any more. Langford said he volunteers as much as he can. He has worked at Birth Choice sorting clothes and assembling mail-outs, and he works with the homeless through his church, Hillcrest Baptist Church. "I keep myself busy doing anything I can to help people," Langford said. "It helps them and me." He said the multiple sclerosis has not kept him down. It mainly affects his short-term memory, but he said it is not too bad. "It's really what you make of it," he said. Betty Cash, a friend of Langford and his wife, Geneice, cut his hair at First Impressions. Langford donated about eight inches to Pantene Beautiful Links. He said he plans to grow his hair out until it is long enough to donate again. Langford said he wants to encourage people to help out the less fortunate any way they can. "It's not hard," he said. "It just takes a little time and effort." Reach Nathan Handley at (731) 425-9641. Follow him on Twitter @NathanHandley.